Thanks to Carl, who sent Geography this brilliant postcard of Australia. 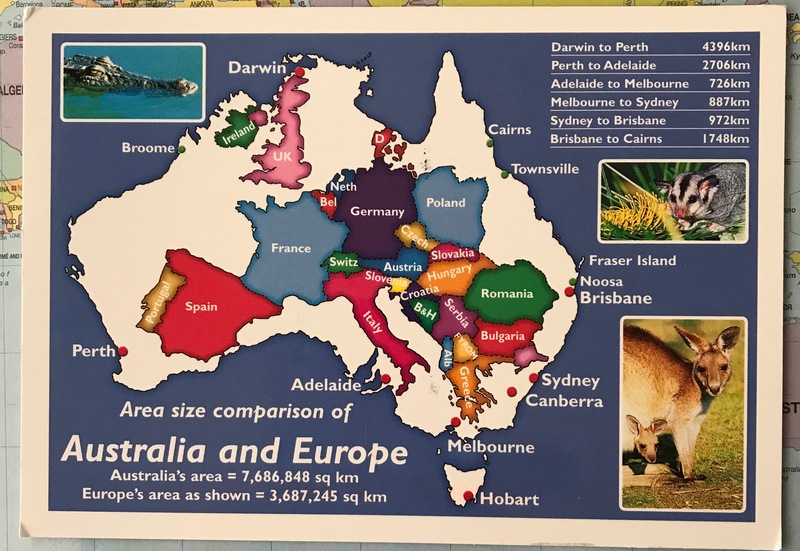 As you can see a map of (most of) Europe fits right in on top of Australia, and that Europe has a surface area of 3.5m square kiliometres, less than half that of Australia at 7.7m. Have a go yourself, and be amazed! Why do countries appear to be different sizes when you look at a variety of maps? The true size of different countries and continents is an interesting question. I believe that the reason that depending on which map you look at, countries can appear to be different sizes is to do with the projection used. Representing something large and round on a small, flat piece of paper does require some compromises. The traditional Mercator projection apparently makes Africa look significantly smaller compared to Europe in order to fit it all in, Also the true size of the Oceans is underrepresented especially the Pacific. Some islands in the Pacific Ocean get left off maps, even New Zealand!